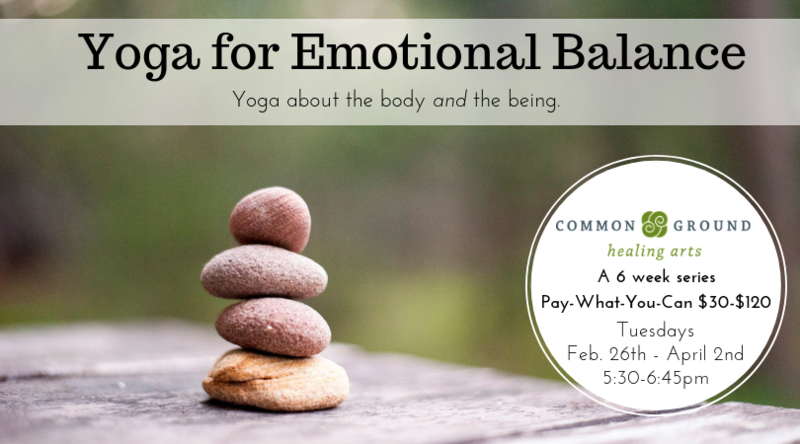 Click here to sign up for Yoga for Emotional balance! Having difficult emotions is part of life. Feelings of anger, frustration, sadness and anxiety are normal. What causes problems is when our emotions interfere with day to day life. Yoga provides a way to be present to what we are feeling in the moment without getting stuck there. This class will offer a hatha yoga practice with practical tools for accepting how we are feeling in any given moment and how to move through it with grace and resiliency. Self-soothing practices and ancient yogic techniques that work in our modern times will be shared. All levels of experience are welcome and encouraged to come with an open heart and a notebook. Yoga isn’t just about the body it’s about the being. This course will be offered on Tuesdays, 5:30 – 6:45pm from February 26th to April 2nd. This series will require a minimum of 8 people to be signed-up. If we haven’t hit the minimum we will contact those already signed up so that we all have chance to recruit a friend or two in the last few days! Please note: refunds are not available for missed classes. No substitutions. Cancellations for this series must be made 24 hours in advance of the first class. Chitra Kate McDevitt RYT500 has been teaching Integral Yoga since 2003. She teaches Basic and Intermediate levels as well as Restorative Yoga. She has been working with Durga Leela and Yoga of Recovery since 2011 which combines ayurveda, yoga philosophy and 12-step principles. She is certified through the Lotus Palm School of Thai Yoga and is a Phoenix Rising Yoga Therapist which combines classical yoga techniques and elements of contemporary body-mind psychology.